To say that we here at Mark Mitsubishi are excited about our newest fleet of Mitsubishi Mirages would be an understatement. We realize that Mitsubishi has developed a very loyal fan base, and one of the main reasons for that would be because of all of the unique technological features that the Mirage has to offer. The Mitsubishi Mirage features an available screen link that is associated with your smartphone. You can assess all of your wireless technology on a 6.5-inch touchscreen display. This would include the latest backing up technology as well. The Bluetooth is also useful for allowing you to bring your favorite playlists with you. The majority of audio streaming devices are compatible. 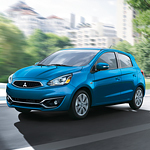 Those who enjoy long drives will find a lot of appealing features in the Mitsubishi Mirage. Moreover, the Mirage is a fit for almost everyone’s budget, starting at just $13,795. Come in to Mark Mitsubishi and take a look at them today!